Corporate executives have them. Teenage girls have them. So do truck drivers and police. Your grandmother probably even has one. Smartphones are a staple of modern life. With an infinite number of apps, they offer something for everybody, but the military is one of the last realms where they still aren’t being widely used. Marine leaders are looking to change that with a rough plan to give Marines in every MOS a smartphone or tablet. The Marine Corps Warfighting Lab at Quantico, Va., will conduct testing this winter to determine how they could be used by everyone from infantrymen to logisticians. Military-specific apps could help track shipments in the warehouse, call for close-air support on the battlefield, or even identify bad guys with biometric face recognition. 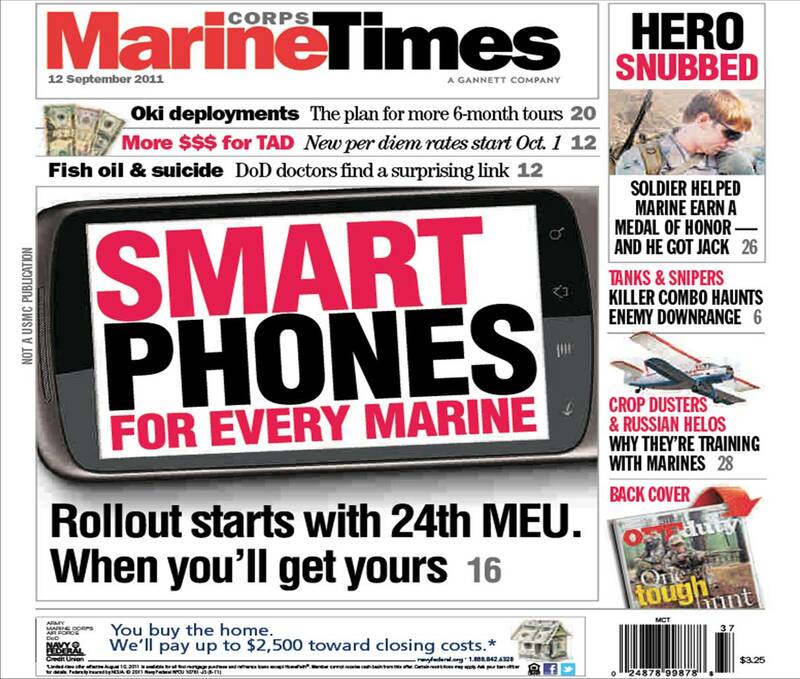 For details on what the devices can do and who could get them check out this week’s edition of Marine Corps Times, on newsstands now. Or, subscribe here. Yeah…..I work at the 24th MEU. This is 100% false. I mean really? The MCT is just mad because they’re no longer a Marine Corps pulication. So they are just making up crap to sound good.